‘Pearls should be worn,’ jokes Paula O’Brien as we drive down a rough track bordering the remote waters of King Sound. On her finger is a large ring sporting a lustrous example the size of a fat chickpea. It’s the sort of bold jewel that would immediately get eyes swivelling at a posh dinner party, but Paula’s wearing it amid the hot and dusty wilds of the Dampier Peninsula, where cyclones rampage and the coastline is a bewitching canvas of turquoise sea, green bush and red soil. ‘All the girls have pearls here,’ Laura laughs. ‘It’s an occupational hazard.’ She works at Cygnet Bay Pearls, a family-run saltwater pearl farm where you can learn how these prized adornments are cultivated, then buy them ‘from the cellar door’ rather than a glittering showroom. Civilisation lies 200km south, down a dirt road that leads to the booming resort of Broome, Australia’s pearling capital since the 1890s when it dominated the world trade in mother-of-pearl buttons. The first divers were Aborigines – in particular pregnant women who, it was thought, had the lung capacity to stay underwater the longest – followed by indentured Asians. It makes grim history, but today Broome has a Chinatown with street names such as Johnny Chi Lane, and an incongruous run of glitzy boutiques selling pearls galore. ‘That’s our fainting sofa,’ an assistant tells me, ‘where the men collapse when they hear the prices…’ A fine show-off necklace will set you back at least £2,500, but there are many other ways to have a pearl-perfect time here. You can stay at McAlpine House, an antique-filled pearling-master’s residence that is now an eight-room boutique hotel with tropical gardens, while the Pinctada Spa offers treatments using pearl products to enrich the skin. 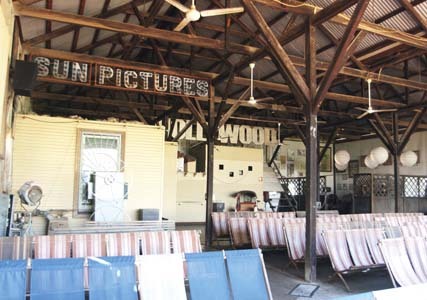 Broome also has Sun Pictures – opened in 1916, it’s the world’s oldest operating outdoor cinema – as well as sunset cruises on Intombi, a wooden sailing boat built in 1903 to harvest shell. There are also dreamy mango farms where you can buy the fruit in every way from jam to dessert wine, and a wealth of restaurants, including Matso’s, a microbrewery serving intriguing dishes such as Chinese-style kangaroo with pomegranate molasses. For all its whirl of pearl, most people visit Broome for another reason − to savour the 22km swathe of Cable Beach, a tremendous run of pale sand liberally sprinkled with happy families, tireless surfers, ecstatic dogs and muscle-bound lifeguards. Although we think of Australia as a place for winter sun, its northern half is best visited during our summer, which coincides with the dry season from May to October. Arriving in June, I find a large sign boasting that today’s temperature will be 31°C, with the sea a not-bad 23°C. Check into the Cable Beach Club Resort & Spa, the only hotel right beside the beach, and you’re well-placed to join the genial crowds that gather every evening for camel rides, sundowners and a chance to watch Broome’s sensational Indian Ocean sunsets. And that’s just the beginning. Inland lies a vast majestic wilderness known as the Kimberley that is bigger than Germany but only has a population of 38,000. Still unknown to many Aussies, it’s a raw, weather-lashed world of portly baobab trees and tin-roof houses, 30,000-year-old rock art and three truck road trains that stop for no one. Shopaholics will struggle, unless you fancy buying a tell-all book about ‘millionacre cattle queen’ Sheryl McCorry. The adventurous explore this region on epic drives along the 660km unsealed Gibb River Road that thrusts east to Kununurra, while time-strapped travellers can use the Kimberley Aerial Highway that offers flights to over 20 air strips originally built as supply posts and for flying doctor services. Climbing into charter planes, buzzing over isolated outback homes, flying past cattle stations so big the mustering is done by helicopter – it’s all great fun, while a 10kg luggage limit enforces a return to basics. And when you touch down, there’s often no mobile signal, TV or internet access, ensuring a complete break from our over-stuffed world. ‘We call it the digital detox,’ my bush pilot quips. A favourite destination is El Questro Wilderness Park, where visitors can get close to nature with gorge walks, scenic driving trails, river cruises and the chance to bathe in thermal springs fringed with glossy palms. You can glamp in stripy green tented cabins set on stilts at Emma Gorge, which were good enough for Kylie and her family, or swap swag for swank in the eco-retreat suites at The Homestead, which have a freestanding bath set on a cliff-edge overlooking a river full of crocodiles. Meals are delicious, featuring red emperor fish and rosella ice cream all washed down with those fab Oz wines − although the wilder side of life is never far away. On the opposite bank of the Pentecost River lies a massive tangle of flood-ravaged red-gum trees that looks like a really bad bad hair day, and no one seems too flustered when the bartender finds a metre-long banded tree snake in the cocktail cabinet. An hour’s flight south, Purnululu National Park is home to a scenic wonder and World Heritage site that only came to light in 1983 when a visiting film crew received a tip-off in a local bar. The journey here passes over the vast, man-made Lake Argyle, home to a mine that produces over 90 per cent of the world’s pink diamonds. Just as I’m thinking it’s a shame we can’t stop to see if they’ve dropped a few, the landscape below bubbles up into a range of eroded sandstone peaks reminiscent of egg boxes. 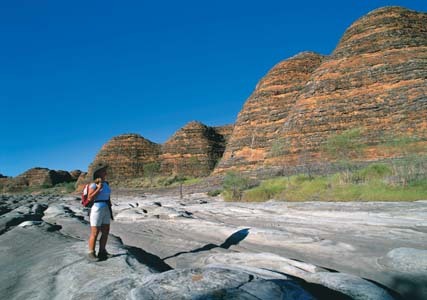 Twenty million years in the making, the Bungle Bungles are a natural marvel striped in strange black and orange bands − most visitors just fly over them, but it’s worth staying a night or two to explore an enchanting world of cone-shaped rocks and cathedral-like gorges. 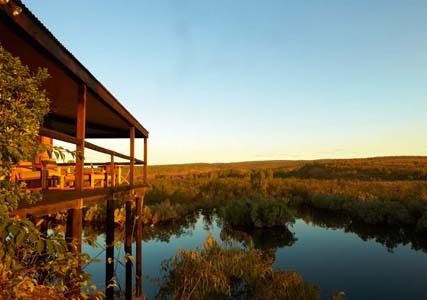 The Bungle Bungles Wilderness Lodge offers designer tents with proper double beds, director’s chairs and coir matting, plus a hearty campfire dinner of porterhouse steak, ginger and orange sweet potato mash and apricot crumble. The next morning, walking under a clear blue sky through the abundant wildflowers and towering copper-coloured rocks, it becomes obvious that a trip out here is not just about having good times – it also reconnects you to the beauty of the universe. It’s a lesson that is banged home again back in Broome, when I join Greg Quicke, a local astronomer with a long white beard à la Merlin, for an evening gazing up at a night sky ablaze with super-bright stars. As we stand beside an arsenal of telescopes, enjoying close-ups of Saturn’s rings and mysterious galaxies tens of thousands of light years away, it’s refreshing to be reminded how puny we really are. All those many things we fret about, from personal relationships to that letter from the taxman, seem insignificant once you become immersed in the immense, patient world of the Kimberley. To borrow a popular local phrase, this really is the land of no worries. Singapore Airlines (singaporeair.com) flies from London and Manchester to Perth via Singapore, from £1,065 return (business class costs from £4,425 return). See skywest.com.au for flights to Broome and the Kimberley. Tailor Made Travel (tailor-made.co.uk) offers an eight-day Kimberley Air Safari visiting Broome, El Questro and Purnululu from £3,199 per person, including flights, breakfast, park activities and some meals, plus two nights at Cable Beach Club Resort & Spa (cablebeachclub.com), Emma Gorge (elquestro.com.au) and Bungle Bungle Wilderness Lodge (kimberleywilderness.com.au). 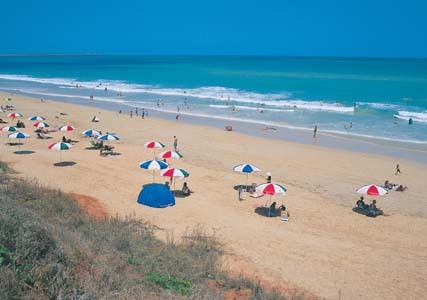 For Broome, visit cygnetbaypearls.com.au, kimberleyaviation.com.au, astrotours.net, broomelugger.com, mcalpinehouse.com.au, broomemovies.com.au, and pinctadacablebeach.com.au.